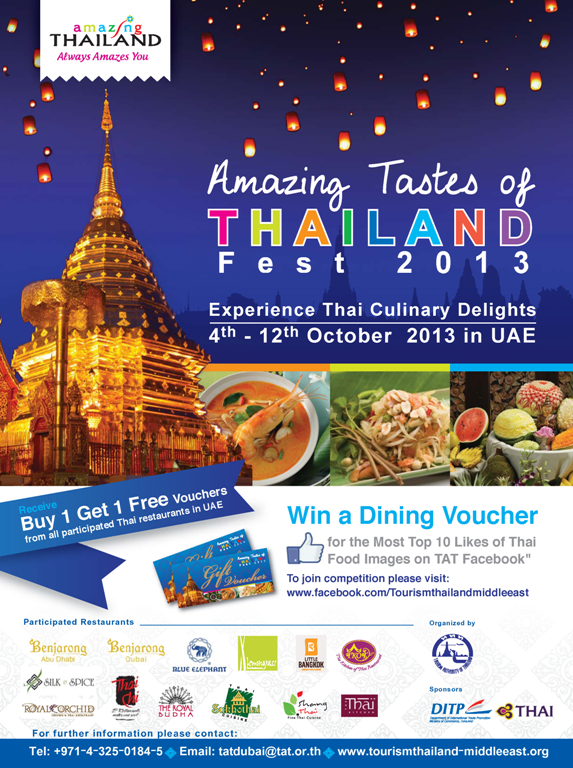 (Dubai, 30 September 2013) The Tourism Authority of Thailand (TAT) has announced ‘The Amazing Tastes of Thailand Fest 2013’ is to be held from 4 October – 12 October 2013 at 13-participating restaurants across the UAE. 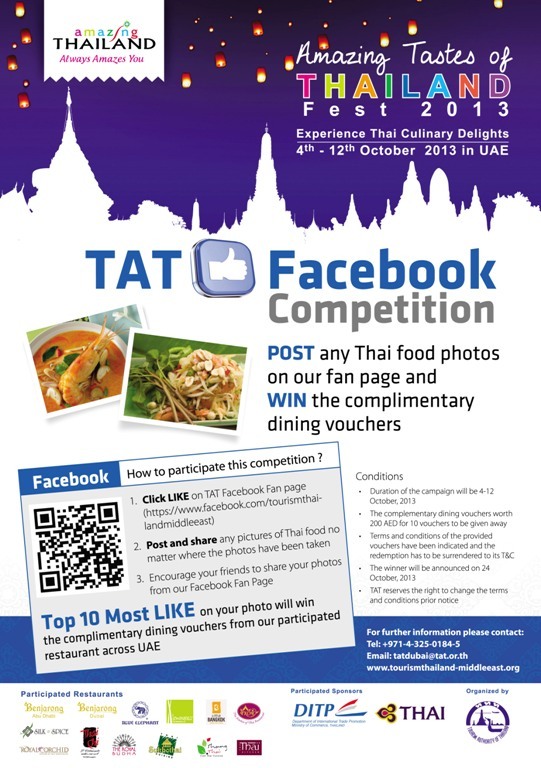 Throughout the week-long Thai Food Festival, UAE residents and visitors will have the opportunity to win AED 200 worth of dining vouchers from all participating restaurants through a social media competition that will launch at Tourism Authority of Thailand Dubai and Middle East official Facebook page. The top 10 most number of likes on shared photo will win and receive exciting prizes. The launching ceremony of the festival will take place on 30th September 2013 at Al Wasl Ballroom-A, Dusit Thani hotel. The venue will be illuminated with floating buoyant decorations to celebrate the world renowned Loy Krathong festival which was annually celebrated in Thailand in November and known as the Festival of Lights. “Loy Krathong Festival has a special significance for all Thais and is a wonderful opportunity for visitors to Thailand to witness a rare event full of Thai pomp and ceremony. I recommend those in the Middle East considering visiting Bangkok and other cities like Chiang Mai and beyond to plan their visit to coincide with the Loy Krathong festival, as this will no doubt provide a spectacular memory of authentic Thai festival that visitors are otherwise not able to ordinarily witness”, Mr. Suranat added. All 13 participated restaurants will show case their appetizing special dishes at the Launching event on Monday, 30 September 2013, at Dusit Thani, Dubai. These include Benjarong Dubai, Blue Elephant, Sukhothai, The Kitchen of Thai, Shang Thai, Thai Chi, The Royal Budha, The Thai Kitchen, Little Bangkok, Lemongrass, Royal Orchid in Dubai as well as Benjarong Abu Dhabi, Silk & Spice in Abu Dhabi. The Amazing Taste of Thailand Fest 2013 will insert a special Buy 1 Get 1 Voucher page in Time Out Dubai October 2nd and 9th issue and Time Out Abu Dhabi October 2nd issue.